A.B. Gibson combines tropes from The Texas Chainsaw Massacre and other slasher films with elements from the gothic novel to develop a disturbing, if familiar, horror story. As Halloween approaches, it’s the last few days for the annual Pumpkin Fest. Families enjoy hayrides and picking apples and pumpkins. 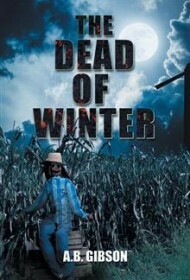 But, as the short first chapter suggests when a lady gets stomped in the face in the corn maze, all is not right at Winters’ Farm and Orchard. Enter four yuppie friends: Josh and Julia, a married couple; their single friend, Tara; and their gay friend, Dillon. The four have driven up from the city to spend the weekend at the Orchard. They check in with Ma and Pa Winter, the “kindly” couple in charge, and soon they meet Carrie Masterson, a strangely dressed guest who begins warning them about the place’s evil reputation. Before long, Carrie loses her head to a chainsaw on a late-night hayride, but the four friends think it’s all part of a Halloween act and proceed as characters in a slasher movie should, frequently going their separate ways and into places where they obviously should not. While many elements in The Dead of Winter will be familiar to horror aficionados (an evil clown, deformed children with burlap masks, secret passageways, a subterranean dungeon, etc. ), the conclusion should surprise. And Gibson offers vivid descriptions of the various settings, including the ominous pumpkin patch and farmhouse. His sharp dialogue illuminates well the hedonistic character of the four friends. The author’s attempt to write in present tense, however, provides a stumbling block. Occasional lapses into past tense are distracting and awkward, and having the story occur in the present doesn’t work with the otherwise original and inventive conclusion. This is not a subtle work of horror, and there are none of the supernatural elements that some enjoy, but, overall, this is a solid inaugural offering that fans of the genre should appreciate.